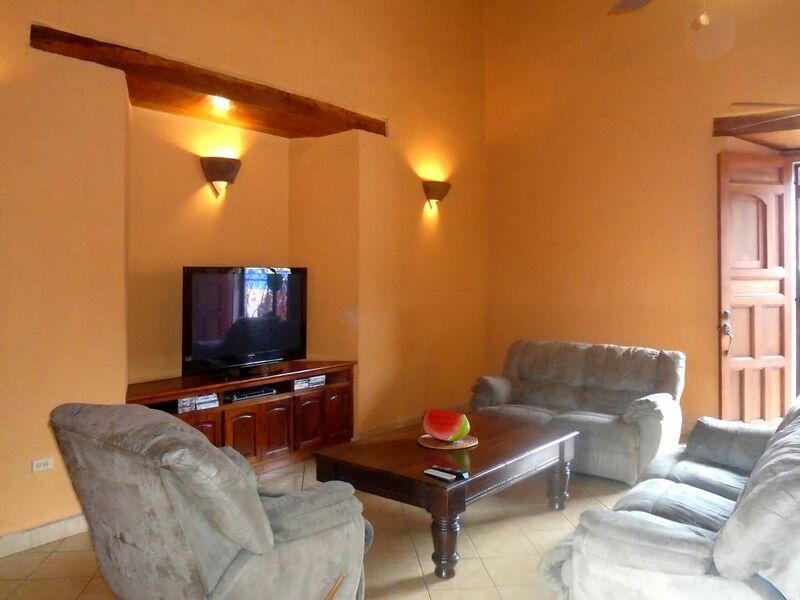 As you enter the home, you encounter a comfortable and inviting living area, a great place to watch TV or read a book. The sofa and loveseat both recline so you can watch TV or your videos in comfort. Like all colonial style homes, the main focus of the house is the indoor garden and surrounding corridors. Casa Agualuna surprises you with a raised living area, surrounded by water and the mango shaped swimming pool. The colors are vibrant with a Mexican flare that is fun and exciting. There is a beautiful open kitchen which is fully equipped with everything you need to enjoy a meal with friends. The large dining table for eight is just off the kitchen with a great view of the pool and gardens. For a little quiet time and additional seating, there is a separate sitting area with custom-made banana leaf furniture just to the left of the dining area. Upstairs, you will find a beautiful bedroom suite with a custom-made king bed. The patio has exquisite views of the church spiral and rooftops of Granada. The master bath is a place of luxury with beautiful stone and tile work, a rainfall shower, a Jacuzzi and a large dressing area.